Have you heard the buzz? Bee relocation is one of the best services for you and your bees. When it comes to bees, often our first thought is to run away and hide– especially if we have had the misfortune of being stung in the past. 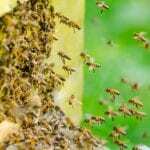 Bees can wield some painful stingers, especially if you happen upon the types of stinging insects that attack in swarms like wasps or yellow jackets. However, while most of us fear bees at least on some level, here at Florida Bee Removal we also appreciate bees for their hard work and pollenating potential. That is why we have started to offer bee relocation services to our St. Petersburg, Florida clients. On many occasions, our customers don’t necessarily mind that there are beehives, but they don’t want the beehives on their property. Bee relocation from Florida Bee Removal is the perfect compromise because it enables the bees to continue to live and pollenate elsewhere. This is a crucial step not only to their survival, but to ours as well! Many species of bees that we depend on to pollenate as much as one third of the food we eat are dying off, and bee relocation is a perfect way to help these creatures thrive in a safe environment while also keeping your property safe. It’s a win-win situation! Bee relocation is much more complicated than simply shooing the bees away from your flowers every day! Bees are excellent locaters and can return to any area that has even a trace of a former hive or scent. That’s why it’s crucial that you hire our professionals who will not only handle the physical bee relocation, but also ensure that the bees will learn to find their new home base instead of yours! Contact us today for the buzz on bee relocation questions and services– we would love to hear from you!